They failed. On that day, despite the combined efforts of the greatest powers of Gaïa, no one was able to stop the coming of the final horror. The unnamed nightmare took physical form and altered the very pillars of reality. Gods fell, ancient powers rose, and the entire world was swept to the edge of destruction. The entity now feeds on the power of the dead gods, devouring their essences to consume all of existence and create a new one in its own image. Conscious of the ultimate danger, everyone with the strength necessary to face the entity has emerged from the shadows. Now...it is up to you to play them, control their incredible abilities, and stop the thing that should not be. The Twilight of the Gods. Fantasy Flight Games is excited to announce the upcoming release of Anima: Twilight of the Gods ! As a shadow stretches out across the land, a handful of stalwart heroes stand defiant. 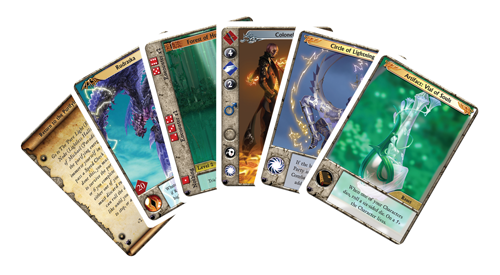 Anima: Twilight of the Gods serves as the final entry in the trilogy of card games that began with Anima: Shadow of Omega . Do you have what it takes to create a suitable end to this epic adventure? Anima: Twilight of the Gods is a standalone card game can be played by itself or combined with Anima: Shadow of Omega or Anima: Beyond Good and Evil , or both! Regardless of how you choose to play it, Anima: Twilight of the Godsgives players the chance to explore this unique world and test themselves against deadly creatures, devious plots, and cunning groups of opposing heroes. The game is played over a series of rounds where each player explores different locations in search of the answers they need to complete their individual missions. Once players accomplish their Basic Mission they may attempt the Final Mission, which is the path to victory! Twilight of the Gods comes with over 100 cards, a rulebook, character counters, and dice. Assemble your party and take a stand against the malevolent power of Genesis, the supreme being of evil! Anima: Shadow of Omega is a card game for 2-5 players that takes place in the high fantasy world of Gaïa. Illustrated by some of the finest fantasy artists of Europe, Japan, and the US, Anima immerses players in a fully-realized world of adventure and excitement. With Anima: Beyond Good and Evil or Anima: Twilight of the Gods , players can alternate or expand their Anima card game experience.